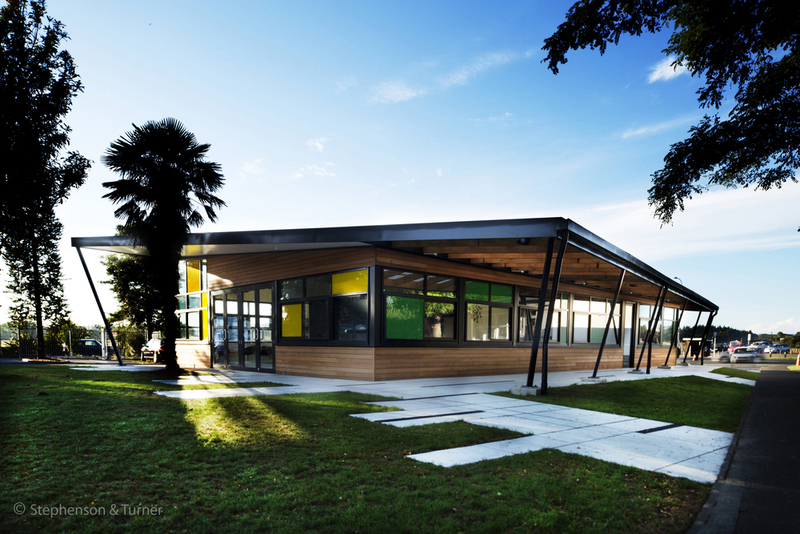 The aim of designing a new administration building for Whenuapai Primary School was to create not only a welcoming entrance to the school but also to include the school’s identity within the design. S&T achieved this by moving the location of the building to the entrance of the school; replacing the main drop-off road with a welcoming playfulness in which the school’s logo would be represented in terms of colour on each façade of the building. The building responds to neighbouring elements on site, fire regulations, future expansions and budget restraints. To overcome the monotony of a typical rectangular building the aim was to give an impression of a changing façade: playing tricks on one’s eye whilst moving around it. The tilt of the roof enhances this feature, but also gives a hint of aerodynamics; connecting with the identity of the neighbouring Whenuapai airbase. The horizontal cedar cladding leads one into the site, but is lightly interrupted with the shadows of rafters supporting the external transparent roofing, whilst coloured concrete strips reflects the carpet pattern internally. Interiors have been planned in four quarters, again to reflect the school’s logo. Offices (Quarter Green), has passive surveillance over the tree lined courtyard in which students regularly play. The Staffroom (Quarter Yellow), opens to the north and changes hourly not only with the sun but also as teachers move in and out during their rosters. This quarter was deliberately placed opposite the existing hall, for entertaining when functions are held. Services (Quarter Blue), is placed adjacent to the school’s access road, and Reception (Quarter Red) is the only part of the building that has a deliberate diagonal cut to allow views in to the school but also to announce the entrance of the building. It faces the drop-off area, gracefully welcoming pupils.